As many people will be doing as 2014 comes to an end, I wanted to look back over another year of great Bluegrass. Many highlights spring to mind, attending another HoustonFest in Galax, Virginia - surely one of the very best Bluegrass & Old-Time events in South-Eastern USA, visiting the Blue Ridge Music Center for some open-air music in a beautiful setting - how much better can it get than to drive down the Blue Ridge Parkway to go and listen to music? The return visit to MC at Bristol Rhythm & Roots introducing such musicians as Donna Ulisse, Mark Schimick & Josh Daniel and Red Molly brings fond memories. A year of hosting a Bluegrass radio show has also brought me into contact with Bluegrass friends from Japan to New Zealand, across Europe and the USA.....what a year! But what European Bluegrass event has left the most lasting impression on me? It's a tough choice..it is like watching your favourite sports team win a glorious victory with a magnificent team performance then being asked to choose who would be Man of the Match (or MVP, if you prefer) but, on balance, Eagle Music's Banjo 8 event has (for me) been this year's most memorable European Bluegrass event. The Banjo 8 event was recognising Eagle Music's 8th year as Deering Banjos' leading retailer worldwide - a significant achievement in itself; the fact that The Kruger Brothers would be playing at the event was a clear bonus. So..what made this such a memorable day? The day started with a welcome from Steve Noon, owner of Eagle Music and then from Janet & Greg Deering who, not only welcomed everyone attending and congratulated Eagle Music on their 8th year as the world's top seller of Deering Banjos but there was also an offer from Greg Deering to give anyone's banjo a set-up. The evening performance by The Kruger Brothers was everything that one might expect - quite simply, the audience were enthralled and the musicianship unsurpassable but it was the workshops that really left a lasting impression. Before I describe the workshops I should mention the performance by (two-thirds of) The Old Grey Dogs - Joe & Bob - who not only performed a very well-received set in the afternoon but also led a jam session in the period between the workshops and the evening performance by The Kruger Brothers. The two most notable workshops, in my opinion, were by The Kruger Brothers and by Andre Dal of Stonebones & Bad Spaghetti. During the Kruger Brothers' workshop, Jens gave an insight into his general approach to playing, to the dynamics of his performances of different pieces and, along with Joel and Uwe, demonstrated his approaches with such tunes as 'Beautiful Nothing'. The workshop also included questions from the audience, one which resulted in a very entertaining spontaneous song-writing exhibition. Andre Dal's workshop was a fascinating view into a musician's skill and determination. Andre travelled from his home in Portugal to be at the event, and because of transport delays, arrived that the venue just 10 minutes before he was scheduled to take the stage. Despite this brinkmanship, Andre appeared unfazed and, in modest fashion, then described how he overcame a physical problem with his hand which threatened his ability to play banjo - as mentioned before, Andre plays banjo with Portuguese band Stonebones & Bad Spaghetti. Andre contracted a condition which put his hand into a clawed position which severely impacted his ability to play his 5-string and could have brought his playing days to a premature end had it not been for his remarkable determination to continue playing Bluegrass and ingenuity in (literally) engineering a solution. While many might have been beaten, Andre built a glove/brace which put his hand into a position where he could access the strings of his banjo and then re-learn his playing technique to compensate for the loss of function in his hand - the result: spectacular. The description of his refusal to stop playing and to find a unique solution was inspiring and Andre's playing?.. in the true sense of the word, triumphant. Before the afternoon closed, there was presentation by Janet & Greg Deering to Steve Noon in recognition of Eagle Music's achievements and sales of Deering Banjos and this concluded in the most appropriate manner - a short mass banjo jam led by Jens, Joel and Uwe. 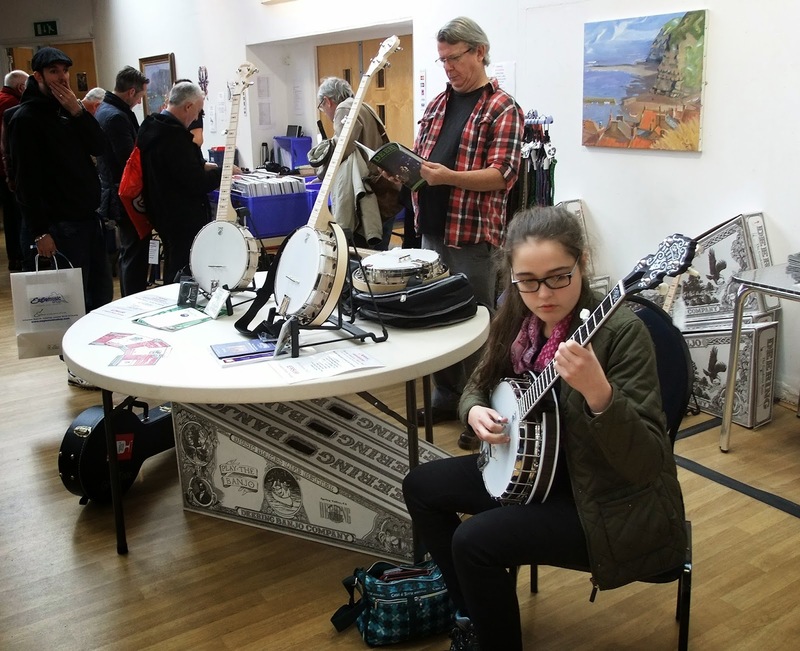 In addition to the workshops there was a fully display of Deering Banjos, some guitars and ukeleles....yes, we went home with a very fine new ukelele! 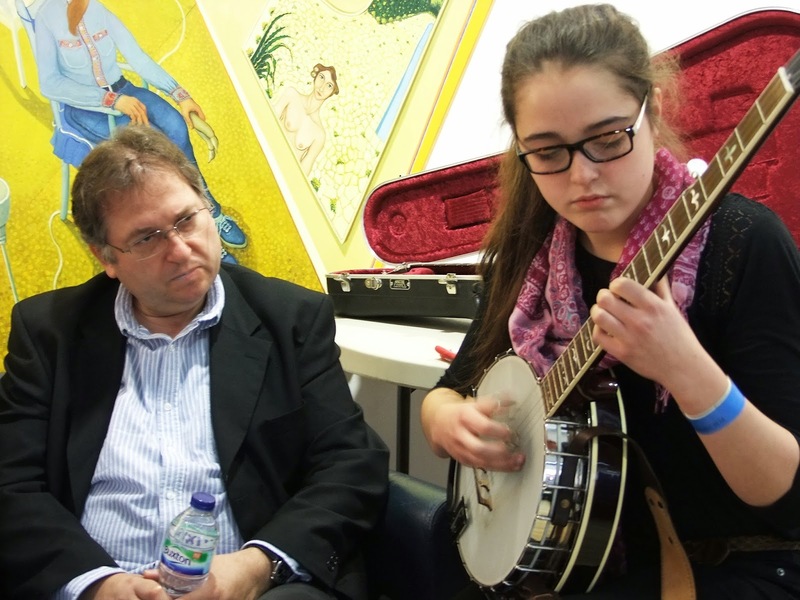 While looking at the banjos on display, there was a familiar face trying out one of the instruments. Tabitha Agnew of the Irish family group Cup O'Joe was putting a Deering through its paces. Cup O'Joe (as described in a previous EBMA article) were the only non-US band to be invited to play on the Youth Stage at IBMA in Raleigh, last September. Cup O'Joe were not scheduled to perform at the Banjo 8 event, their father had brought Tabitha and her brothers Reuben and Benjamin from Ireland to Huddersfield in Yorkshire to attend the event. During the morning, Jens Kruger spent some time chatting with Tabitha who later played for him, soon to be joined by Reuben and Benjamin so everyone present was treated to an impromptu mini-set by Cup O'Joe. It was a pleasure to meet the Agnew family (though Mrs Agnew did not make the trip) and it has been wonderful to hear that, in the past week or so, that it has been announced that Tabitha is now a Deering endorsee. As mentioned at the beginning of this article, the day concluded with a performance by The Kruger Brothers which left everyone on their feet and, naturally enough, wanting more. I should add that the evening concert also included a set by The Kentucky Cow Tippers - surely one of the UK's finest Bluegrass bands. So, through the day there was recognition of Eagle Music's achievements in relation to Deering Banjos - there was illumination and demonstration from one the world's leading banjo players as well as a performance from one of Bluegrass' most popular groups - there was a modest but inspiring description of determination to overcome difficulties and continue to play some fine banjo and a chance meeting with a successful young group of musicians and their father and then seeing them gain wider recognition with Deering Banjos. There are so many different aspects of this day that bring me to the conclusion that this was the highlight of my European Bluegrass year and I can't wait to see what 2015 brings.